In many respects the Kalo Shop was the single most important American handwrought silversmith. 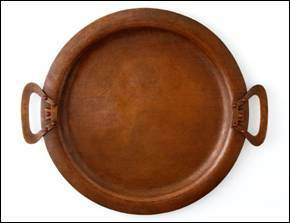 Talented individuals such as Frank Gardner Hale and Edward Oakes were also key Arts & Crafts metalcrafters, and two other large firms -- Arthur Stone and George Jensen -- were in the very top tier of makers, but the Kalo Shop produced the widest range of classic handmade holloware, jewelry, and flatware for nearly 70 years, and was a critical influence in the Arts & Crafts movement. "The Kalo company is the latest group to be formed. It is composed of six young women, Bertha Hall, Rose Dolese, Grace Gerow, Clara P. Barck, Ruth Raymond, and Bessie McNeal, and their company name is taken from a Greek word meaning "to make beautiful." They are all graduates of the designers' course at the Art Institute, and besides designing for wall decoration, produce articles in burnt wood and decorated leather. The workshop of the Kalo company is in the Bank of Commerce Building." 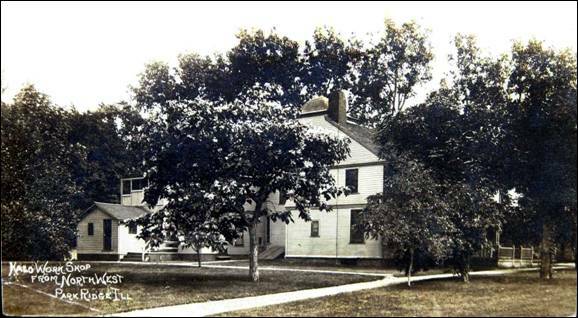 In addition to pyrography and leatherwork, Barck initially sold textiles, copper items, baskets, and jewelry. 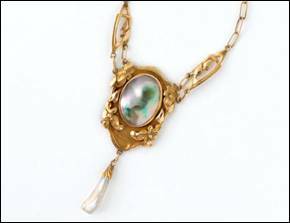 In 1905, Barck married George Welles, a coal merchant and amateur silversmith. 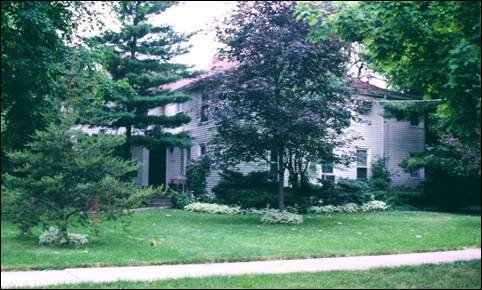 In 1907 she bought the house shown below to serve as the workshop for the Kalo Arts Crafts Community in Park Ridge. 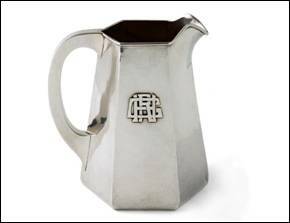 When Clara and George divorced in 1914 and the Shop moved to Chicago, George convinced her to focus exclusively on the handwrought copper and silver items for which it is best known. In 1912 Kalo opened a branch store in New York that lasted only until 1916 because of war constraints (some of the date information courtesy of Chicago metalcraft expert Darcy Evon). While other silversmiths like Randahl sold co-branded products through department stores, the Kalo Shop did not. In the late 1920s Welles tried creating several dozen Danish-influenced items she called the Norse Line to sell through other merchants, but the onset of the Depression ended this venture prematurely. (Norse Line products -- usually marked with an NS in addition to the Kalo stamp -- are rare.) The Shop had a loyal clientele that helped it thrive through the troubled 1930s when many other silversmiths failed. Welles retired to Mission Hills, California in 1939. In 1959, six years before she passed away, she turned the shop over to four of her craftsmen, Robert Bower, Daniel Pederson, Arne Myhre, and Yngve Olsson. When Pederson and Olsson died in 1970, the store closed for good. In an interview in the Summer 1992 issue of American Silversmith, Bower, who managed the operation for its final 30 years, explained why the Shop shut down. "We ran out of silversmiths. In the last year we lost our three top silversmiths; men who could not be replaced. It was difficult trying to find men willing to learn silversmithing and it took years to train them." The Kalo Shop produced handwrought flatware, holloware and jewelry, and trained or worked with noted Chicago metalsmiths such as Julius Randahl, Grant Wood, Esther Meacham, Matthias Hanck, Falick Novick, Heinrich Eicher, and Emery Todd. In the early years most of the output was copper, but quickly changed to silver. It also produced fine gold jewelry. Kalo objects have a timeless, elegant style that seems modern today even though many pieces were made nearly a century ago. Welles was unusual for many reasons. 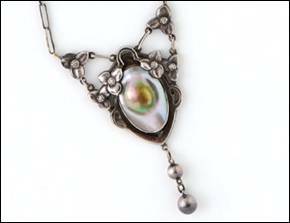 While most other silversmiths of the period ran smaller boutique storefronts, Welles knew from the start that she wanted a large commercial operation. At one point she employed over 25 silversmiths. She hired women whom she called the "Kalo Girls" to design most of the items, and Scandinavian immigrants to fabricate them, at a time when both of these groups were shunned by many businesses. During the first World War silver was scarce, some of her silversmiths were sent overseas, and the influx of foreign silversmith trainees was reduced. Welles adjusted by having her female employees produce smaller items and jewelry. It is this pre-1920 period that was the Shop's most fertile. After Welles retired, the Shop continued making copies of the early pieces, adding a few modernist items and some in the Danish taste. Many of its forms are classics, and very collectible, reflecting Welles' motto: "Beautiful, Useful, Enduring." "A List of Articles that may offer a suggestion for those wishing to make Birthday, Holiday or Wedding Gifts"